Recurrent themes. The era of large-scale genomics in neurodevelopmental disorders has welcomed the discovery of several genes, which predispose to a wide range of neurodevelopmental disorders. While a connection to neuronal function is obvious for a few of them, the function of other genes remains cryptic. Now, a recent paper in PLOS Genetics investigates AUTS2, a gene that is both a candidate gene for autism and a gene that has changed dramatically in recent human evolution. AUTS2. There are two different storylines regarding the AUTS2 gene. One story begins in 2002, when a novel candidate gene for autism was identified in a pair of monozygotic twins. In both twins, a balanced translocation was present which disrupted a novel gene. This gene was subsequently named AUTS2 (the name AUTS1 was already taken as a locus for a linkage region on chromosome 7q22). Ever since then, AUTS2 mutations, deletions or duplications have been identified in a wide range of neurodevelopmental disorders including intellectual disability, autism and epilepsy. The two reported patients with epilepsy and AUTS2 deletions had Juvenile Myoclonic Epilepsy and unclassified epilepsy reminiscent of atypical benign partial epilepsy (Pseudo-Lennox-Syndrome), respectively. The AUTS2 gene is not related to any other gene implicated in neurodevelopment disease, and the function of the protein is unknown. To further complicate matters, some deletions were found in purely intronic regions of the AUTS2 gene. The structure of the AUTS2 gene. The first half of the AUTS2 gene lies within the most significant selective sweep region in the human genome when compared to the Neanderthal genome. In addition, various non-coding regions that show accelerated evolution in humans are located within the introns of AUTS2. Deletions and duplications within this part of the AUTS2 gene are found in patients with various neurodevelopmental disorders. Common copy number variations are only found downstream, but not in the sweep region. Evolution. The second story of AUTS2 begins with the draft genome of the Neanderthal genome. When the first draft sequence of the Neanderthal genome was completed, the researchers included a list of region that underwent a selection sweep, i.e. regions where the selection of specific genetic variants was accelerated. The most significant region in this comparison was on chromosome 7 covering the first exons of the AUTS2 gene. 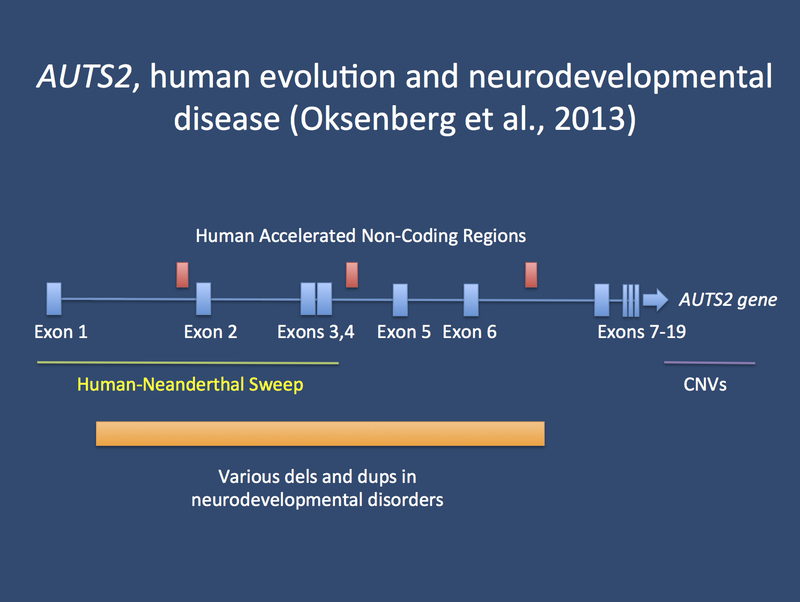 Other genes such as DYRK1A or NRG3 that are also implicated in human neurodevelopmental disease, were also found in similar regions. This finding reinforced the notion that AUTS2 might be important for the development of human-specific cognitive features. Morpholinos, zebrafish and enhancer regions. Using so-called morpholinos to knock-down expression of a specific gene, Oksenberg and colleagues investigate the role of AUTS2 in zebrafish. They find that the lack of AUTS2 leads to smaller head size and various defects in neuronal development. This emphasizes the role of AUTS2 in neuronal development. Perplexed by the fact that some of the reported deletions are purely intronic, the authors also looked at various enhancer regions within the introns. They transferred these regulatory regions into zebrafish and could demonstrate that these regions enhance gene expression in brain regions where AUTS2 expression is observed. This suggests that deletions in these regulatory regions might affect the expression of AUTS2, increasing the risk for various neurodevelopmental disorders. A similar phenomenon was found for some of the non-coding regions, which have undergone rapid evolutionary changes compared to the Neanderthal genome. AUTS2 in evolution and disease. While the experiments by Oksenberg and colleagues revealed a relatively major phenotype that is difficult to interpret with respect to human autism spectrum disorder, their findings indicate that AUTS2 plays an important role in neuronal development including regulatory elements, which appear to have evolved quite recently. In addition to the recent evolution of segmental duplications, which give rise to many of the recurrent microdeletions that predispose to autism, intellectual disability and epilepsy, this evolutionary context might help us understand the role of some of genes implicated in neurodevelopmental disorders including epilepsy. This entry was posted in 2013, autism, human evolution, Papers and tagged autism, AUTS2, DYRK1A, epilepsy gene, human evolution, microdeletion, Neanderthal genome, NRG3. Bookmark the permalink.